Home / Book summaries / How does the internet effect our brains? A summary of The Shallows, chapter 7. How does the internet effect our brains? A summary of The Shallows, chapter 7. 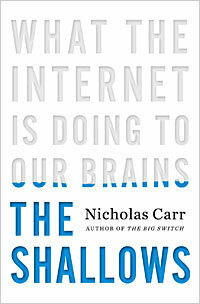 This is my summary of chapter seven of The Shallows: How the internet is changing the way we read, think and remember, by Nicholas Carr. For my summary of the previous chapter, chapter six, please click here. This is finally the chapter where Carr gets to the real point of the book! What can science tell us about the actual effects that internet use is having on the way our minds work? Dozens of studies point to the fact that when we go online we enter an environment that promotes cursory reading, hurried and distracted thinking, and superficial learning. It is possible to think deeply while surfing the net, it’s just not the kind of thinking that that the technology encourages or rewards. The Net delivers the kind of sensory and cognitive stimuli – repetitive, intensive, interactive, addictive – that have been show to result in strong and rapid alternations in brain circuits and functions. With the exception of alphabets and number systems, the Net may well be the single most powerful mind-altering technology that has ever come into general use. When we click a link, we get something new to look at. When we write a blog post, we get comments and new users. The Net commands our attention with far greater insistence that TV or radio: just look at a teenager on their phone as an example, what you see is a mind consumed with a medium, oblivious to everything else going on around them. The interactivity of the Net amplifies this effect…. The self-consciousness magnifies the intensity of the involvement… particularly for the young. One of the paradoxes…. The Net seizes our attention only scatter it. The Net’s cacophony of stimuli short circuits both conscious and unconscious thought, preventing our minds from thinking either deeply or creatively. What we’re not doing online is just as important as what we are doing… web pages crowd out time we spend reading books, bite sized messages crowds out the time we spend constructing sentences and paragraphs, time hopping across hyperlinks crowds out the time we devote to quiet reflection and contemplation. The rest of this chapter Carr devotes to outlining the evidence on how increased use of the Net is changing our brains, most of it decreasing our ability to concentrate, but he does note that not all changes are necessarily bad! Garry Small conducted some research in 2008 in which he found that a region in the brain – the dorsolateral prefrontal cortex was more active in experience net users compared to novice net users. He also got the novice net users to surf the web for an hour a day for six days and on retesting found that this part of the brain was much more active. When reading regular text, experienced net users have active prefrontal cortexes, while less experienced surfers do not – this is the part of brain associated with decision making and evaluation rather than interpreting. The mind of a book reader is calm, the mind of a surfer is buzzing. The depth of our intelligence hinges on our ability to transfer information from our working memory to our long term memory and weave it into conceptual schemas – but we can only store a certain amount of information at a time… our cogntivie load – when this is breached, info is not transferred. Two of the biggest sources of cognitive overlaod are divided attention and extraneous problem solving, both things the internet encourages. Frequently switching between tasks can greatly add to our cognitive load. Carr now cites various pieces of research that people who get information from just one source remember more information when tested. It seems that multimedia education do not work to improve learning, necessarily. There are a few upsides to our changing brains in the internet age….. Expansion in capacity of working memory. However, overall, multitasking hampers our ability to think creatively and deeply….. it odes not make us more productive. For my summary of chapter eight please click here. To purchase the book (it’s a cracking read!) please click below! Next post: Video Games Disorder: Just Another Moral Panic about Gaming?